Now through November 30th, World Hyundai in the Matteson Auto Mall is having a Chicago Hyundai Black Friday Sales Event and Reveal a Deal sales event showcasing daily deals now through the end of the month. Have you been considering getting a new or used car before the winter hits? Now is a great time. We’re got vehicles with Black Friday deals and pricing available with all price ranges including a few door buster cars that you can get for VERY LOW PRICES! In addition to our Black Friday Sales Event, World Hyundai is having a Reveal A Deal Sales Event where customers can take advantage of daily deals revealed on our website! Looking to buy a remote start? Maybe some window tint? Check out our Reveal a Deal website and see what we’re offering today! 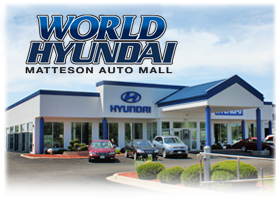 For more information about current Hyundai Black Friday deals in Chicago, see World Hyundai Matteson.